The history of this instrument is a long and fascinating one. In 1631, Robert Dallam built a new organ for Magdalen College, Oxford, where it was erected in an ‘organ house’ opening on to the south side of the chapel. In 1654 it was moved to Hampton Court Palace, where the poet John Milton is reputed to have played it. The instrument was returned to Magdalen in 1660 and re-erected the following year. The organ was substantially remodelled by Renatus Harris in 1690. In 1736 the organ was sold to Tewkesbury Abbey and later placed on a special stone screen constructed on the site of the medieval pulpitum. A Swell Organ was added by John Holland in 1796. Major rebuilds followed – by ‘Father’ Willis in 1848 and J.W. Walker in 1948 (when the Echo and Solo departments were added and a detached five-manual console was installed). 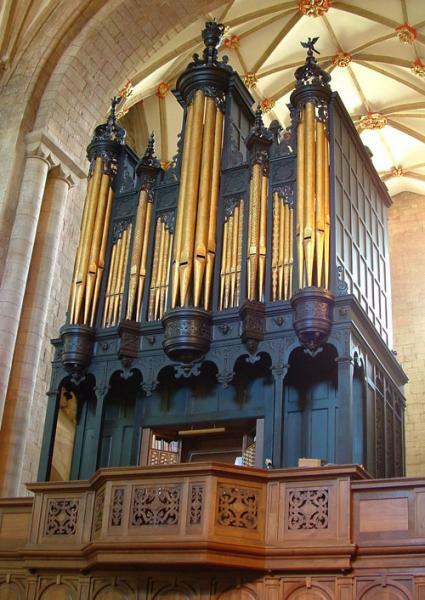 In 1997 the Milton Organ was rebuilt and reconstructed by Kenneth Jones and Associates of Bray as a four-manual instrument with 68 speaking stops and 4611 pipes. The lower three keyboards have mechanical action, whilst the Solo and Apse divisions have electro-pneumatic action.